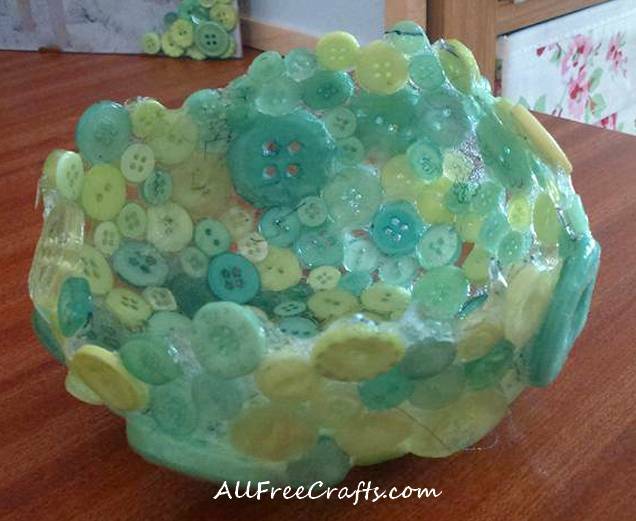 How to make a decorative bowl from mod podge and lots of buttons. 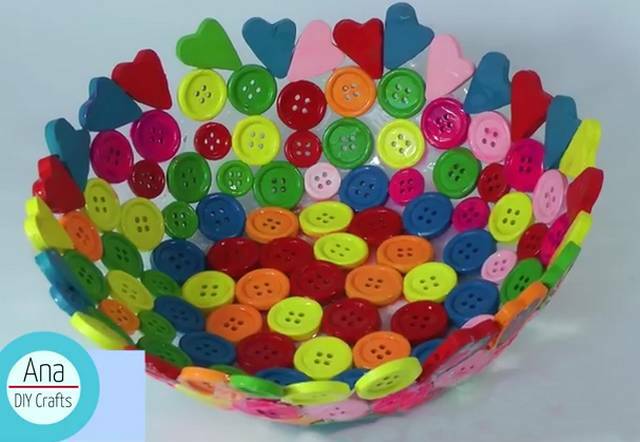 Time: There is no quick way to do this craft project because you will need drying time for small patches of buttons; please count on several days to complete the bowl. 1. Rest the balloon knot side down onto the top of the bowl or pot. 3. Wait for the glue to dry a little so that it feels tacky to the touch. 4. Press on your buttons, try not to overlap them. Keep them close together. Tip: I had problems at this stage because I used a very small balloon and the sides were fairly steep. My buttons kept sliding off the surface – so I had to do a small area on the top, leave it to dry, rotate the balloon a bit, then add a few more. Each time you add a few buttons, you’ll need to let the glue dry overnight before adding more. You’ll need lots of mod podge to secure the buttons. 5. Once you have stuck enough buttons on the balloon to make the bowl size that you want, and the glue is dry, add a new coat of glue on the outside. Be generous. Repeat once the glue has dried overnight. 7. Pop the balloon and remove it from your buttons. Coat the inside of your bowl with another layer of glue. 8. Allow at least 2 days drying time before adding something to the bowl. When it is first made, the glue is quite soft and flexible so you can manipulate it into the shape that you want. It’s never going to be a perfect bowl shape as the weight of the buttons pulls it out of shape slightly. Completed mod podge button bowl; while the glue is still flexible you can adjust the shape a little bit. Every bowl will be unique! 9. Put something lightweight into your bowl. I have put some nicely fragranced potpourri into mine. 10. NB: This bowl is NOT waterproof, nor water resistant, unless you use glue that states that it is. Nor is it heat proof, so don’t put anything hot into it. Remember, it is decorative, rather than functional. Enjoy your bowl! In this video tutorial, learn how to make a button bowl with a rick rack or ribbon rim. The glue used in this project is PVA or common white glue. Running time: 2:44 minutes. Slightly quirky video showing how to make a sea glass bowl from collected or purchased sea glass, tacky glue, a bowl, and plastic cling wrap. The first attempt doesn’t work well, but that’s ok, because you can learn from someone else’s mistakes. 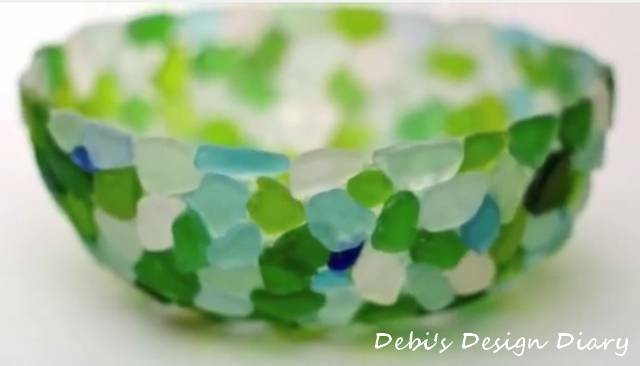 Simply avoid having the sea glass slide off the bowl by building the sides from the bottom up; also apply lots of glue to support the weight of the glass. Running time: 4.59 minutes. Button bowl made with a foil foundation. Several examples of button bowls made by first lining another bowl with aluminum foil, then gluing buttons on top of the foil. Running time: 3:13 minutes.